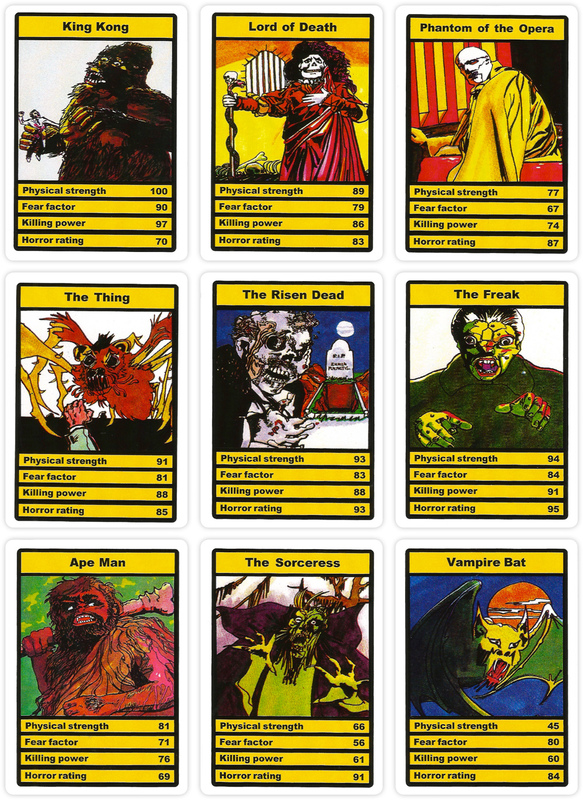 Top Trumps Horror cards, Dracula set (1978) | 'TAIN'T THE MEAT… IT'S THE HUMANITY! During the late 1970’s school break-time meant play-time and the options available to the average bored school kid were fairly limited. ‘Army’ was always an option, but running around pretending to shoot your mates with a tommy gun, while making a daft laughing sound (‘hahahahahahahaha!’), wore a bit thin after a while. There was perennial favourite British Bulldog, the rules of which I still don’t fully grasp even now, forty years later. Hide and seek? That helped kill some time, I guess (although if you were feeling a little more adventurous, and had a tree handy, you could always give Acky 123 a go). On the whole though break-time could be pretty tedious. Thank God for Top Trumps! The stats card game swept the UK during the late Seventies and relieved us from break time tedium. Well, for a while anyway. The Top Trumps Dracula set was released in 1978 by German company Dubreq, inventor of analogue keyboard Stylophone. The Dracula set was a companion set to the Devil Priest Top Trumps game (which I’ve looked at here). In the early Eighties Dubreq were bought out by UK game giant Waddingtons who repackaged all the early Dubreq sets, changing only the logo on the front. The Dracula set contained 32 cards measuring 59 x 92mm, as well as a rules card and a free pack offer. 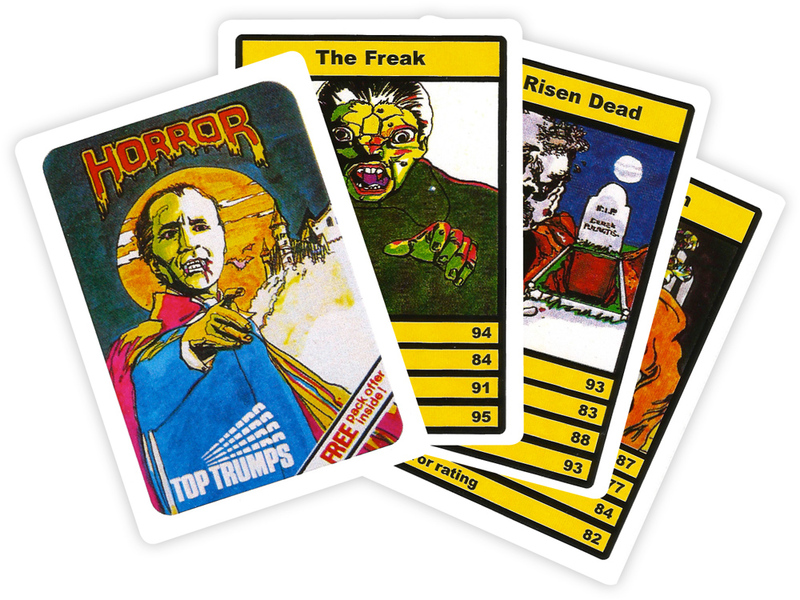 Following the pattern established by earlier Top Trump games, each card featured a horror character with four stats: Physical strength; Fear factor; Killing power and Horror rating. The strength of the game lay in it’s simplicity: all the cards were dealt to the players and the first kid picked a stat, and whichever player had the highest number in that category won all the cards in play. The game would then continue in rounds until one player had won all the cards. Simple enough for even the slowest school kid to follow. As entertaining as the Dracula game was, it was the illustrations on the cards that really caught the eye. 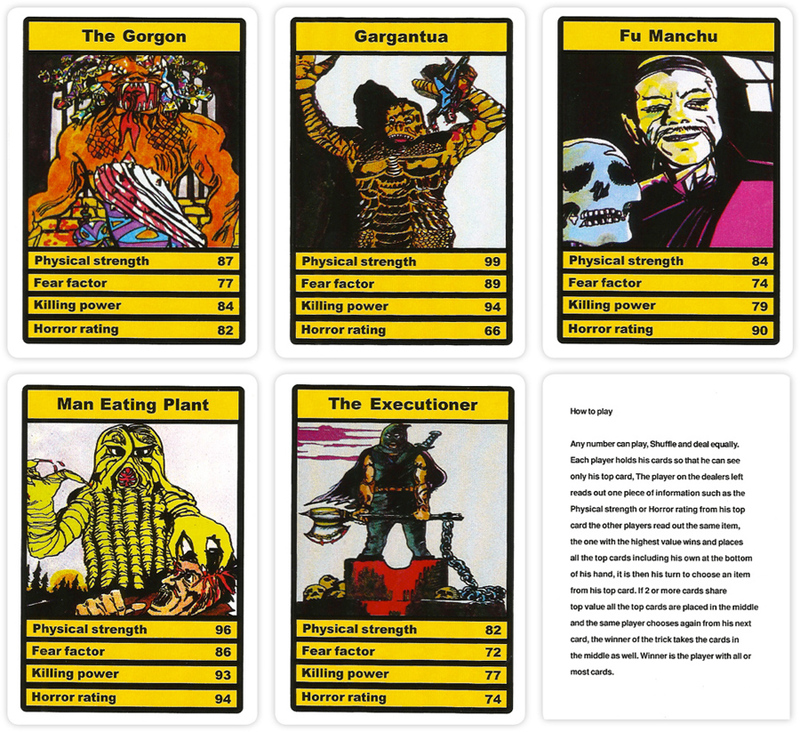 Traditionally Top Trumps cards featured photos of the game’s theme – cars, tanks, planes, warships, etc – but the two Horror packs featured rather gory (and gaudy) pen and ink drawings of various evil-looking monsters. I’ve already discussed my failure to discover the identity of the artist so all I can say is he (or she) really outdid themselves with this pack – it’s far bloodier than the Devil Priest set, with almost every card featuring some evil apparition dripping blood. Even today they hold a certain macabre fascination. 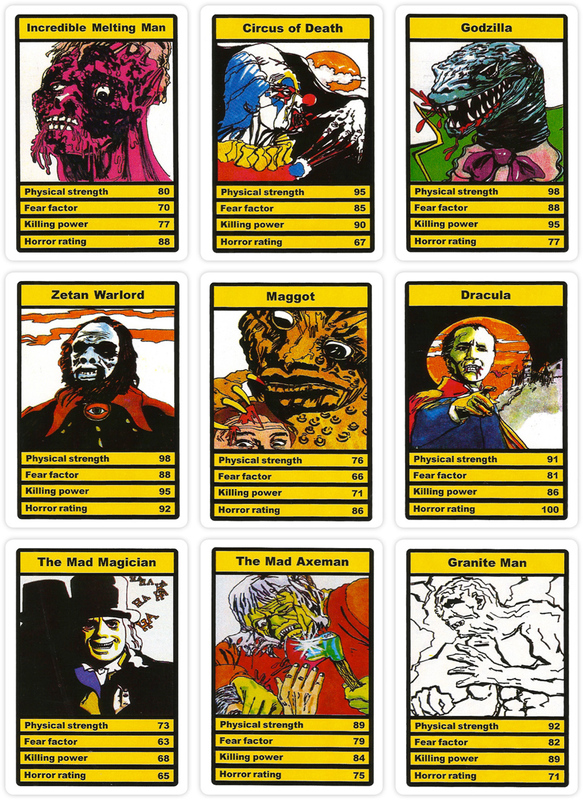 As with the Devil Priest set, Dracula Top Trumps featured images of monsters liberally swiped from the movies. First off Dracula featured a drawing of recently deceased (and much missed) Christopher Lee from Dracula, released in 1958. The Freak was pinched from another Hammer film, The Reptile (1966), while The Hangman and Lord of Death both feature Lon Chaney from The Phantom of The Opera (1925). Some of the steals are a little more obscure: The Thing was from The Angry Red Planet (1959) while Man Eating Plant was swiped from I Married a Monster from Outer Space (1958). I could go on but you get the gist. How Dubreq got away with such blatant thievery is beyond me. The other thing I remember from playing this game when I was a kid was the randomness of the scores. The 100-foot high (or so it seemed) King Kong had a Horror rating of 70, much lower than Fu Manchu. I don’t know about you, but I know which one I’d rather have chasing me. And the Zetan Warlord‘s Killing Power is the same as Godzilla’s (who for some bizarre reason is wearing a rather snazzy jacket and bow tie). Hmmm, not sure about that, Godzilla is pretty damn big. Random scores aside the game was jolly good fun to play and helped while away many a school breaktime. 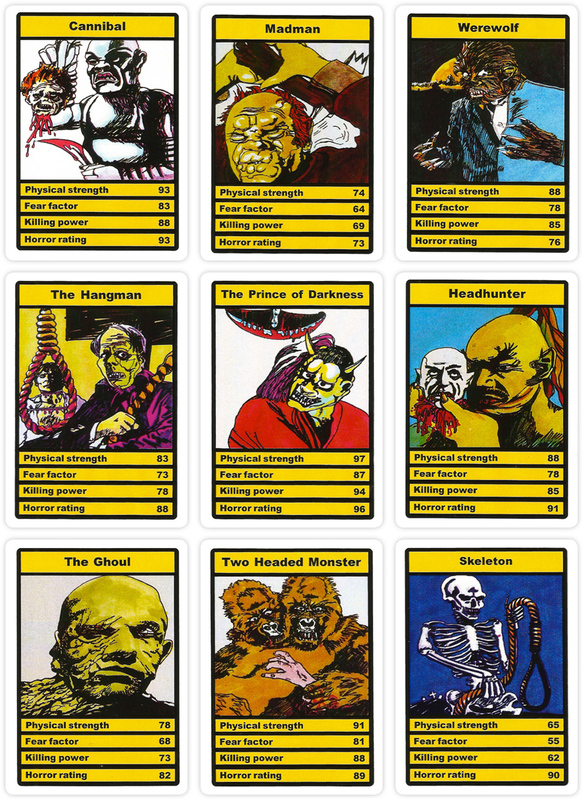 So here is the second set of Top Trumps Horror cards – the Dracula pack – in all it’s blood-curdling glory. I’ve also uploaded the rules card in case anyone fancies a game. Enjoy.